You won’t want to come back. “You’ve never been to Italy?” This phrase, expelled mid-gasp, has been said repeatedly to me here at Domino. And yes, much to my eternal shame, I had never been. Given a characteristic need to feel “unique,” I was determined that my maiden voyage to the Bel Paese would not be characterized by fighting my way through waves of Hawaiian shirt–clad dads in a well-known tourist trap. Little did I know that this conviction would lead me to one of Europe’s most stunning cultural and geographical treasures: the world of Alto Adige, Italy. Although the charms of this alpine haven are well-known to European wine and winter sport enthusiasts, every New Yorker who learned of my upcoming trip responded with a befuddled, “Alto… what?” Although it likely didn’t make the pages of your world history textbook, Alto Adige (its Italian name), also known as Südtirol (“South Tyrol,” which is its Austrian name), is a small mountainous region crowning the northernmost border of Italy with a complex cultural tale worthy of its own History Channel special. Descended from the ancient Roman Empire, Alto Adige has at various times been part of the Austrian Empire, Austria-Hungary, and post-WWI annexation in 1919, Italy. After continued cultural turmoil during and after WWII, the region was returned to Italy. Following generations of governmental iteration, Alto Adige reached its current state of affairs—an autonomous region made up of two provinces (South Tyrol to the north, bordering Austria and Switzerland, and Trentino to the south, bordering Italy proper) representing a multicultural population that by default speaks both Italian and German (and thankfully, English) and represents these historical influences equally. A disarming harmony of Alpine and Mediterranean cultures, home to some of the most contented people I’ve met (“why would I ever leave?” was a common local refrain), the essence of Alto Adige is charmingly exacting to define. As the memory settles into sensory brushstrokes of crisp mountain air and taste bud–tingling charcuterie, let me paint you a pair of portraits of this enchanting locale and implore you to append it to your travel bucket list pronto (for the pragmatists, the best airport to reach the region by is Venice’s Marco Polo). For a nature-starved New Yorker, taking my first few steps out of the cable car (no subways here!) onto Seiser Alm, the largest high-altitude Alpine plateau in Europe, was instant medicine. 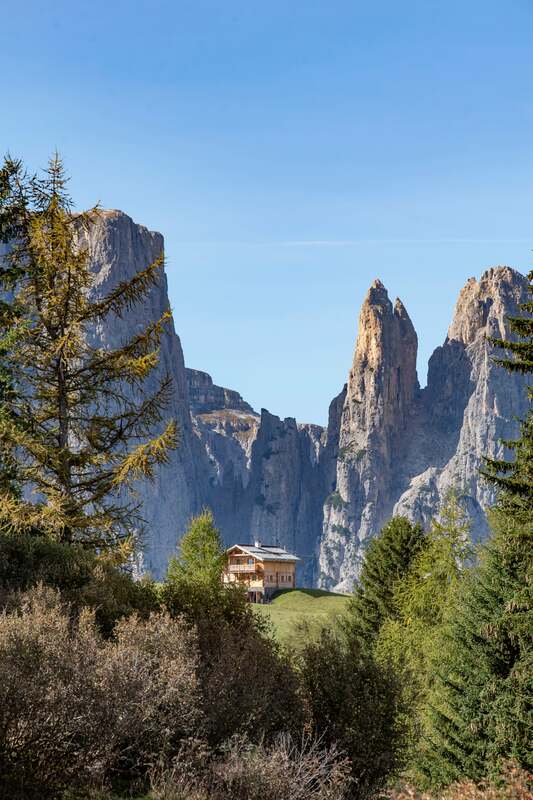 Located in the Dolomites mountain range, the plateau is a true natural wonder. Soft, grassy slopes dotted with amiable swaths of evergreens are framed by the rounded, craggy peaks of the Dolomites, an iron-gray band dusted with snow and set in sharp relief to the azure sky. The day’s fall weather is highly favorable, the air brisk but not wintry, the sun bright and warming (the region is graced with 300 sunny days a year). In further contrast to Manhattan, where concrete presides at all angles, one can take in these Arcadian splendors from 360 degrees (instilling in this author the profound desire to perform his best Julie Andrews impression). After much gaping and failed attempts to capture this scene in Panorama Mode, it is time to feast more than the eyes at lunch (we are in Italy, after all). Riding in style by horse-drawn carriage, we climb higher into the verdant hills, arriving leisurely at the top culinary destination of Seiser Alm, the restaurant Gostner Schwaige. Housed in a quaint modernized log cabin on a rambling property featuring both farm outbuildings (“schwaige” being the German name for an Alpine dairy farm) and plentiful outdoor tables and lounge chairs in which to take in the astounding natural landscape and gently grazing herd of cows, Gostner Schwaige is a place out of another time. While the luxuriously unhurried environment indicates opposition to the frantic hustle of the Internet Age, Gostner Schwaige is in no way backward when it comes to cuisine. Our palettes whetted by a curiously refreshing blend of prosecco and hay syrup, we were treated to a choice tasting plate of house-made cheeses (eight types are made on the property) and thinly sliced rolls of Speck Alto Adige (more on this unique aged, smoked ham below), followed by carob ravioli dressed with pine pesto and rich red wine beef goulash juxtaposed with a crispy walnut dumpling. Our elevated Alpine feast culminates in a homey plum dumpling perched in a rose compote and house-made vanilla ice cream. Each flavor profile is approachable yet complex, each dish is plated with a contemporary eye yet playfully references the rustic surroundings with the consistent inclusion of edible herbs and flowers. If possible, the mastermind behind this experience, farmer/chef Franz Mulser, was even more delightful than the food itself. Clad in a traditional felt hat, checked shirt, and lederhosen with a beaming smile and unmistakable love of craft ever evident, Franz embodies the purest intentions of the farm-to-table ethos. For those desiring to fully breathe in the sweet and grounded experience of a Farm Holiday, one can find accommodations on the farm in Aussergost, a charming four-suite Alpine manor owned by the Mulser family for more than 500 years. As if my eyes had not already had their fill of breathtaking landscapes, my last day in Alto Adige was set in yet another dreamscape come to life, the mountain village of Santa Maddalena. Birthplace of legendary mountaineer Reinhold Messner (the first person to scale Mt. Everest without the use of oxygen), this idyllic valley plays host to an annual festival dedicated to Alto Adige’s gastronomic specialty, Speck. This aged, smoked ham is traditional to the region and has been perfected over centuries. Every year, it’s celebrated by thousands of festivalgoers every year with two days of food, drink, and traditional music and entertainment. Why the fuss over this particular pork product? Known by its full title, Speck Alto Adige PGI (Protected Geographical Indication), this specific type of cured ham has been given special designation by the European Union, witnessing that it has been produced according to traditional methods native to the geographical region. Gently crusted with a seasoning of salt, pepper, and herbal blends unique to each maker (rosemary, juniper, bay leaf, and coriander are all popular), lightly cold-smoked, and cured in fresh air for 22 weeks, the final product may remind the American palette of the more familiar Prosciutto and yet is more elegant in its delicately smoky, spicy flavor. After now having sampled far more Speck Alto Adige than I should have (I was at a long table full of jolly, lederhosen-attired friends, so what do you expect? ), I can insist that when you decide to try Speck, make sure it’s proper Alto Adige stock by looking for the PGI marker at your local specialty foods store (or Amazon). Need ideas for how to use this peculiar delicacy? Having recently added Speck to my Brooklyn pantry, I’m looking at these recipes for inspiration. So, yes, I have been to Italy. More importantly, I can share a remarkable side of Italy that feels, as of yet, hidden away from the flood of tourists descending upon the country’s more familiar names. So if you’re looking for a fresh getaway, a place where you can wander through tiny villages of Swiss-style chalets rendered in warm Italian hues, where skiing, hiking, or just staying still are all encouraged, get thee to Alto Adige. Drink the wine, eat the cheese and Speck, and breathe in air that feels just a bit more magia.